More than finding answers, a contemplative life is about learning to live the questions. In recent weeks, questions have abounded more than usual. Questions regarding relationships, career, what to do about the violence in our world – acute questions – have inserted themselves into the mix of the broader-reaching chronic questions that permeate life – those about purpose, truth, and love. I do not know anyone who has answers to life’s most intriguing questions. I know some people who think they have the answers, and who believe they have the “right” answers. I try to steer clear of those people, choosing to love them from a distance. Even within various faith traditions, there is neither any singular tradition nor philosophical treatise that holds the answers to our most pressing human inquiries. While searching for answers may be a well-warranted pursuit, it seems that living into the questions creates a contemplative space for inhabiting the ground of being. Instead of “trying to figure it all out” and finding the “right answers,” living the questions makes exploration possible. Exploring the silent and still space of meditation times, spending time in nature, taking a contemplative walk – these practices offer the opportunity to listen for the answers. 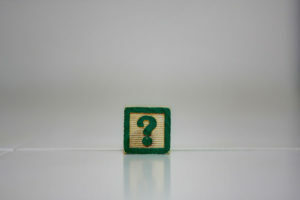 Sometimes, the “answers” appear as additional questions that help us to sift through options, and to discern direction. We can learn to welcome the questions as strangers, showing them the love they merit. As Rainer Maria Rilke wrote in Letters to a Young Poet, “Be patient toward all that is unsolved in your heart…and learn to love the questions themselves…” Maybe by loving them, we will also live into them. The Photo is by Wee Sen Goh, published through Flickr and made available through Creative Commons. Some rights reserved. This entry was posted in Reflections on April 3, 2018 by Roger Sessions.